Dereck Chisora ignited his weigh-in with the WBC heavyweight world champion Vitali Klitschko by slapping the title holder’s face hard during their staredown. Klitschko was visibly infuriated as the pair were pulled apart. Earlier, Chisora had vowed to “shock the world” by snatching the WBC title in Munich. The 28-year-old Londoner challenges Klitschko in Germany this weekend despite two high-profile losses in his past three fights. 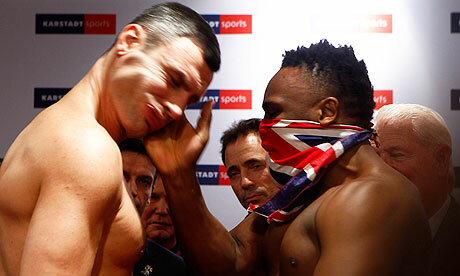 Chisora has already seen two clashes with Klitschko’s brother Wladimir scuppered by the Ukrainian’s injury withdrawals. He was scheduled to fight the 35-year-old for the IBF and WBO belts in December 2010 before a stomach injury forced the champion to pull out. The rescheduled bout in April last year also fell through, with Klitschko blaming a problematic rehabilitation. Wladimir went on to beat David Haye instead, as Chisora remained at domestic level and lost his British and Commonwealth titles to Tyson Fury. Although he went some way to redeeming himself with a career-best performance against the Finnish boxer Robert Helenius before Christmas, a controversial split decision ultimately saw him suffer a second career defeat. The Zimbabwe-born Briton therefore takes on long-reigning heavyweight king Klitschko as a huge outsider, with some bookmakers pricing him as generously as 10-1 to dethrone the champion in his adopted homeland. When not pretending to be worried about Chisora or any of the other anonymous pretenders queueing up for a shot at his title, Klitschko needs little encouragement to talk about the once-loud, now missing-in-celebland Hayemaker, who surrendered his WBA quarter of the world title to Vitali’s baby brother, Wladimir, in Hamburg last July. While the aspiring politician is no one-dimensional stumble-bum pug, Klitschko struggles to understand how a ticket-selling antagonist nine years his junior could walk away from such a compelling life. The inference he draws is that Haye is not suited to the calling – an attitude Wladimir entertained in his early, fragile days in the business. I’m not exactly sure if this fight will air on PPV. In the States it will air on the new movie channel Epix and on EpixHD.com. I haven’t seen it listed on any our PPV channels. If you have more info, please drop me a line. Dr Iron Fist is going to rearrange his body parts!